WASHINGTON — The Air Force has kicked off the second phase of its light attack experiment, which could pave the way for the service to begin buying either the AT-6 or A-29. 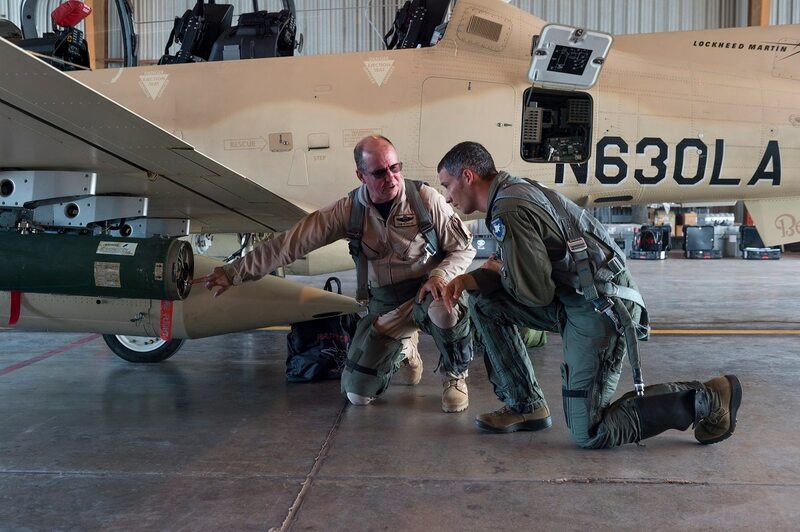 The experiment — which began on May 7 at Holloman Air Force Base, N.M. — will give the Air Force a closer look at Textron’s AT-6 and the A-29 Super Tucano made by Sierra Nevada Corp. and Embraer over the next three months of flight tests. “We’re bringing the team together in the desert to look at primarily the logistics but also some of the weapons integration capability,” Lt. Gen. Jerry Harris, the Air Force’s deputy chief of staff for strategic plans and requirements, said at an Air Force Association event on Monday. The effort will focus on integrating precision-guided weaponry with both aircraft, as well as getting a better understanding of how the service can operate light attack aircraft in austere and high-paced combat environments, he said. Harris also noted another goal: establishing a network architecture that will be able to connect light attack aircraft with other U.S. assets and a wide array of U.S. partner nations, including poorer nations that want to help the United States in the counterterrorism fight but must do so on a tight budget. “Not every country can afford an F-35, certainly some of them can’t afford F-16s and F-15s, so this light attack will give them an option to partner with us so we can go out and have that persistent effect on the battlefield,” he said. During the first phase of the experiment, the Air Force assessed whether four aircraft, including the A-29 and AT-6, could provide a cheaper alternative to higher-end assets like the fourth- or fifth-generation fighters often tasked with low-end counterterrorism missions. This phase of the experiment includes a wide array of participants from the active duty Air Force, Air National Guard and Air Force Reserves, to include fighter, attack, special operations and test pilots as well as flight engineers, according to an Air Force press release. The service has in the past said that it will also invite international militaries to observe the exercise. Pilots will fly air interdiction, combat search and rescue, close air support and armed overwatch missions in both day and nighttime conditions, and Air Force maintainers will observe repair work and flight line operations. With the light attack aircraft experiment, the Air Force is hoping to change the way it buys aircraft. Usually, the service spends years developing requirements for a product before soliticiting proposals from industry, choosing a vendor, awarding a contract and working with the company during a development period that span upwards of a decade. In contrast, the light attack experiment has been limited to off-the-shelf options needing little or no modification work. The Air Force still hasn’t made a decision on whether to buy one of the two aircraft involved in the experiment, Harris said, and the service could walk away from the effort at any time. If the experiment goes well, Air Force Secretary Heather Wilson has said she could ask Congress to reprogram funding to allow the service to begin buying a light attack plane as early as this year.